"Jim Jordan had a duty to protect them — they say he failed," Pelosi said. House Democratic leader Nancy Pelosi said Thursday she believes the former Ohio State wrestlers who say they were abused by the team doctor and who accused their former coach, Rep. Jim Jordan, of lying when he said he didn't know about it. "Jim Jordan had a duty to protect them — they say he failed," Pelosi said at a news briefing in the Capitol. "Rather than deny and dismiss them, he should fully cooperate with investigation. That's what I think he should do." Pelosi weighed in a week after three former wrestlers, in an interview with NBC News, said Jordan turned a blind eye to Dr. Richard Strauss's alleged misbehavior, which they say included molesting them during appointments. Since then, three more wrestlers have come forward to tell NBC News that Jordan must have known because it was all over the locker room. One wrestler has told NBC News that he directly told Jordan about the alleged abuse at the time. 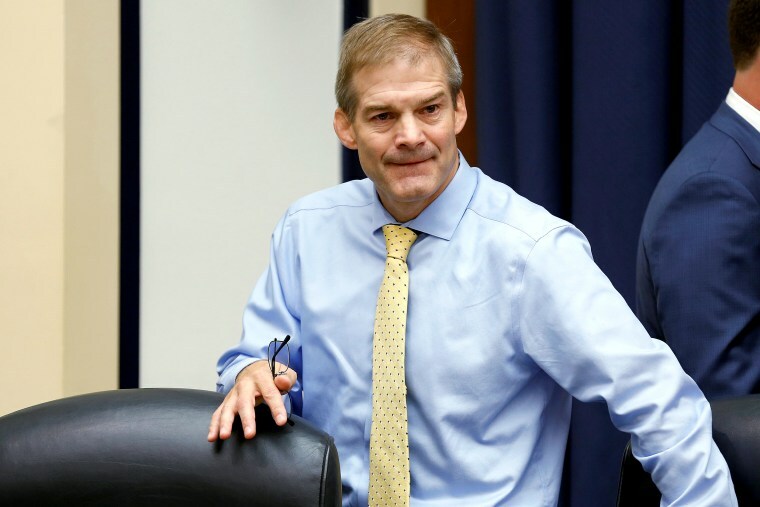 Jordan, now a powerful Republican congressman from Ohio and a staunch supporter of President Donald Trump, has repeatedly denied any knowledge of what Strauss was doing, saying he didn't even hear any of the locker-room jokes about the doctor. He has implied that wrestlers who say otherwise are lying and may be politically motivated. "It's devastating for so many young people who have suffered for years with the emotional pain of this," Pelosi said. "I commend those who have come forward and have brought their personal pain into the public so there can be an investigation." Asked if Congress has a role in the ongoing Ohio State probe into the Strauss allegations, Pelosi answered, "At some point, we'll just see how this goes forward." "But I think the people who came forward thought that he would cooperate in the investigation," she said. "I don't think they came forward as a charge against him. They came forward as a statement of fact which he is denying he had any knowledge of." Jordan, who has made a name for himself in Congress by grilling the federal investigators who are probing alleged collusion by the Trump campaign with the Russians, is going to have to face some uncomfortable questions, too, Pelosi said. "He is a person who has always said, 'Everybody, oh my gosh, will you look at his record? '" Pelosi said. "'So-and-so should have known this, so-and-so should have known that, so-and-so should have known that.' Well many people say that he did know. And by his own standard, he should have known." Jordan's spokesman, Ian Fury, did not immediately comment. Fury previously said the congressman planned to schedule an interview this week with the law firm conducting the investigation on behalf of Ohio State. Pelosi's broadside came a day after Republicans rallied around the congressman and 15 former Ohio State wrestlers issued a joint statement of support for Jordan. NBC News has also spoken to two wrestlers who support Jordan and believe he did not know of the alleged abuse. Ohio State announced on April 5 that it was investigating accusations that Strauss, who died in 2005, abused wrestlers when he was the team doctor from the mid-1970s to late 1990s. The wrestlers charged that Strauss did everything from take long showers with the team to sexual abuse the athletes during appointments. Strauss's family has issued a statement saying they were "shocked and saddened" over the allegations. The prime mover behind the Ohio State probe was a former wrestler and former Jordan friend named Mike DiSabato, who said Strauss groped him a number of times. He got other wrestlers and former head coach Russ Hellickson to speak on video about the alleged abuse and misconduct by Strauss at Larkins Hall, where the wrestlers worked out.